You will be driving from Malaga to the lake of La Viñuela. Exit at hectometer marker 272, heading towards Torre del Mar. At the end of the exit go straight ahead and enter the roundabout. Take the roundabout for three-quarters, and take the exit left towards Velez Malaga, which takes you underneath the motorway. Continue on Mootorway A335, and go straight ahead at the first and the second roundabout. Keep going straight (towards Colmenar), and cross the bridge and the dam. Immediately after the dam, take the exit towards Los Romanes (Motorway MA 129), but watch the traffic situation. You can then take the fifth path to the left upwards the mountain. 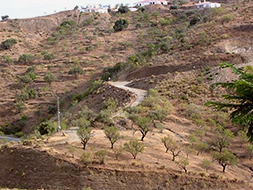 At the end of the path you will find Holiday Villa “Aventurero”.